July 1st: One Day Heat Wave Ahead! The next 48 hours should be fun as we see an abrupt switch to strong offshore flow (rare in July) tonight through Tuesday afternoon, pushing high temps into the mid-upper 90s in the valleys. Then just as quickly we get a surge of wind off the chilly Pacific Tuesday evening through Wednesday, so high temps will drop 14-18 degrees in one day. Further cooling Thursday means highs in the mid 70s. So I think everyone can find something they like in the next 3 days. 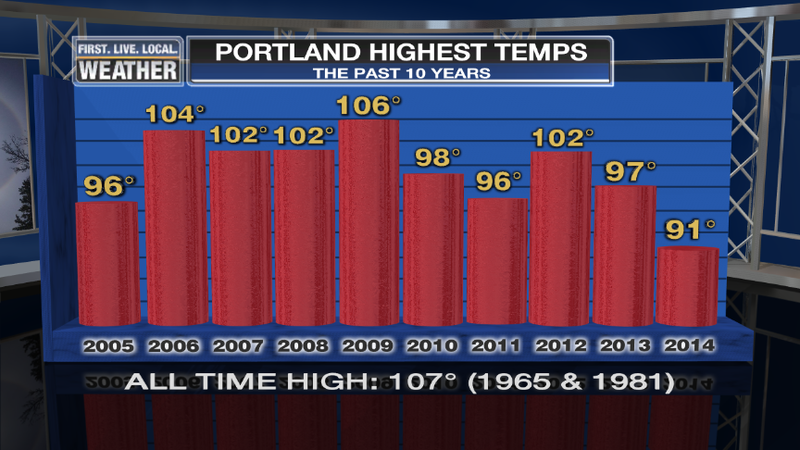 We’re forecasting 97 for a high at PDX Tuesday, at least a 10 degree jump from today. That is the warmest we saw last summer too. That will be the warmest so far this season, we hit 91 back on May 14th, the first 90 of the year. It will not be a record because there was a heat wave during this time in 1942 and we hit 105 on July 1st! No high humidity…we’ll see dry east wind, our typical hot weather pattern. The Oregon Coast should be very warm, especially north of Pacific City, but light west wind after the noon hour should cap Lincoln City and Newport’s high temps below 80. There is only one very warm and sunny day coming at the coastline…that’s tomorrow. June has not seen any temperature extremes, in fact until today (June 30th) we didn’t even get above 81! A bit weird considering the month was average temperature-wise. One would think at some point we would have seen an 85 or 90 but no. Tomorrow’s forecast high temperature has been steadily creeping upward the past few days, partly due to confidence in a sharp thermal trough setting up west of the Cascades, but also due to 850mb temps warming in successive model runs. The 12z suite of models (NAM, GFS, ECMWF) are all showing +22 to +23 deg. 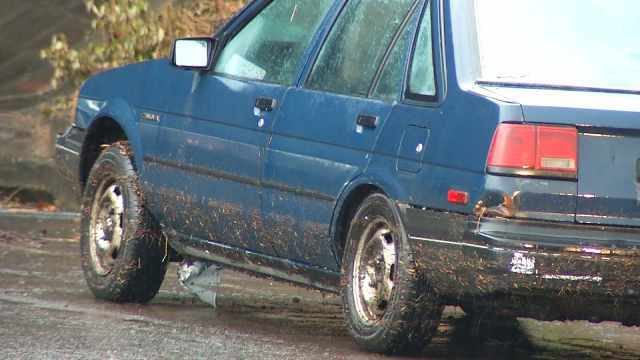 C over Salem tomorrow afternoon. Looking at my chart of past cases with easterly flow at that temperature, we should see a high between 96-100 degrees, so my 97 might be slightly low. Everything appears perfectly aligned for maximum heating tomorrow, including a drop off of the wind at max temperature time around 4-6pm. There is even a chance we hit 100 tomorrow afternoon at PDX. Since the upper-level trough is shifting east rather quickly later tomorrow and Wednesday, the center of warmest weather will shift quickly east of the Cascades tomorrow night and Wednesday. That means a pretty decent onshore flow will immediately follow tomorrow’s offshore flow. And that equals a quick cooldown. 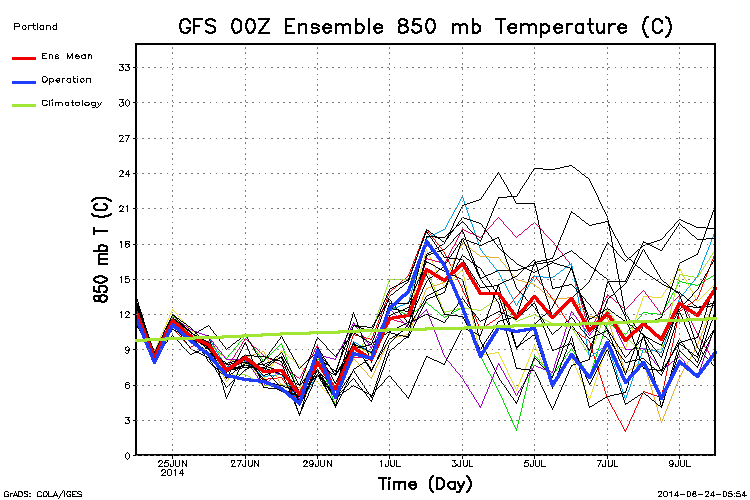 showing temps near average through the 8th, and the operational run is the chilliest of all the members. So (normal operating procedure) I ignored the GFS. muddy water up above the doorline. 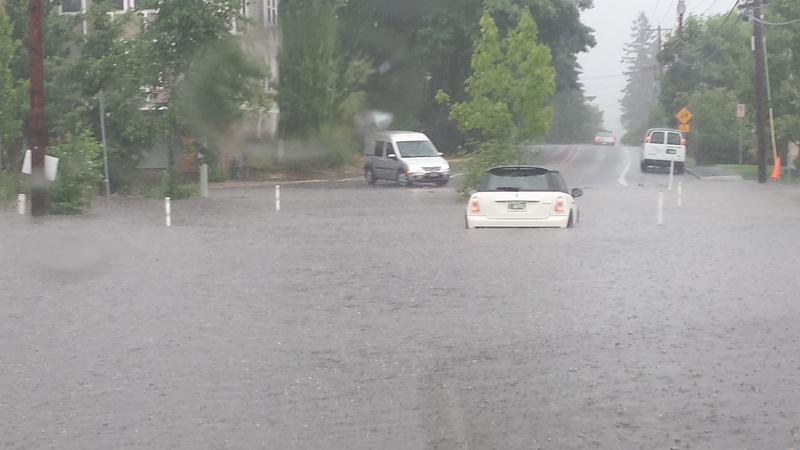 At 10pm the driver said the water was up to his knees! 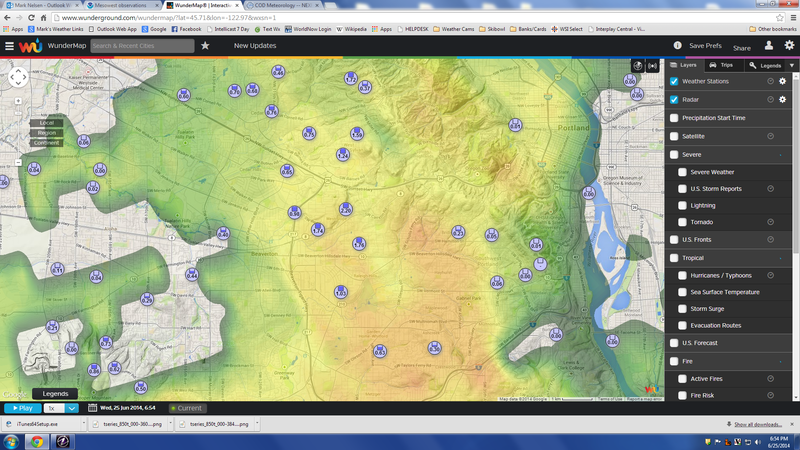 Almost nothing (or nothing) fell in Scappoose, Hillsboro, Aurora, and Troutdale. 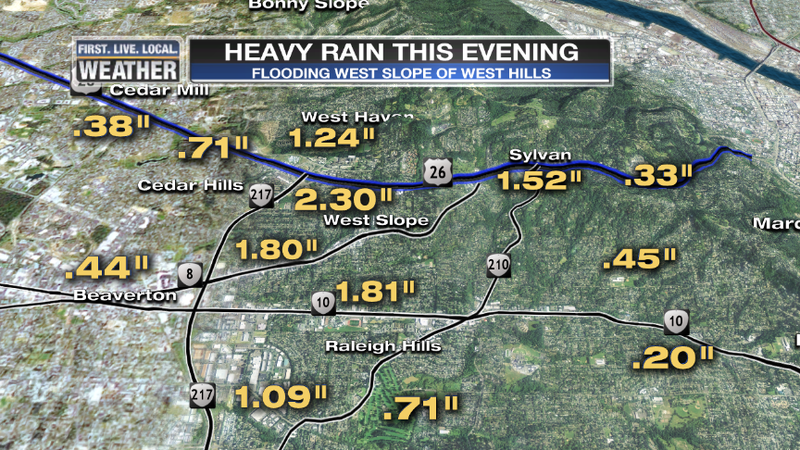 From 5-7pm some areas received 1-2″ of rain! KPTV is located on Highway 26 just east of the Cornell exit…we received .38″, but you can see 5 times that fell just a couple miles to the east. 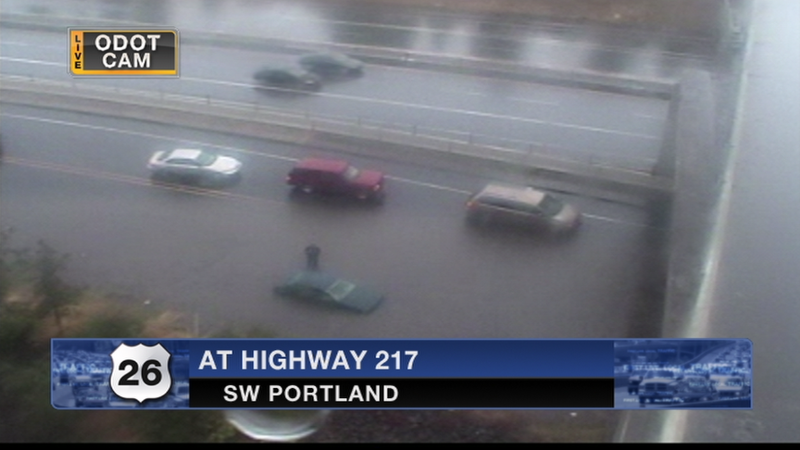 We were watching two flooded underpasses at the 26/217 interchange through the 6pm show. Expect more showers this evening, and once it rains in your neighborhood it’ll suddenly turn very humid! Luckily Sophie and I saw 00z models last night keeping us dry most of the day in the metro area and made a dramatic change to the forecast (towards dry). I think the showers will just gradually fill in through the evening hours with a slight chance of thunder. We’ve got a wet system on Friday too, plus leftover showers in onshore flow Saturday. After that we get at least 3 days of warmer than average summer weather the beginning of next week. 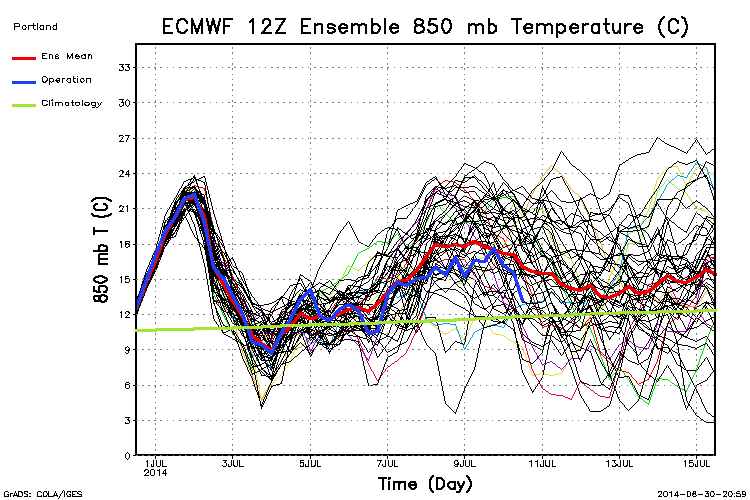 Notice the jump in 850mb temps on both the 12z ECMWF and 12z GFS ensemble charts. 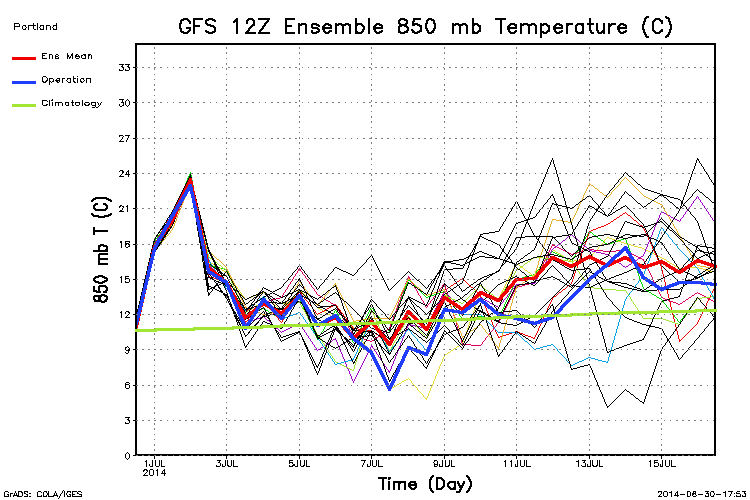 Ensemble means are both right around +15 Monday and Tuesday, which supports mid 80s in late June or early July. 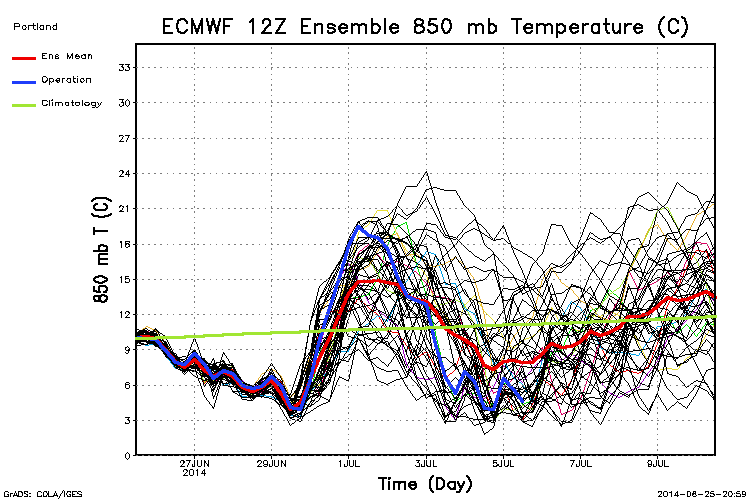 Quite a bit of variability (spread in ensemble members) on a cool trough approaching for…4TH OF JULY! We’ll see how that goes. 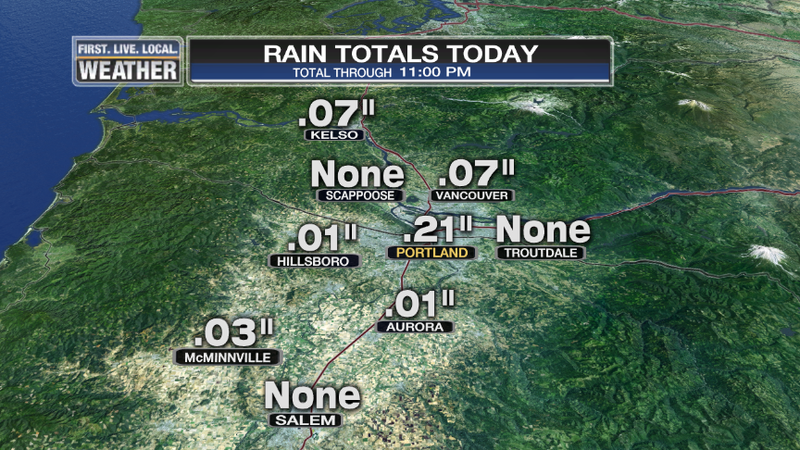 This was after another very warm day…temperatures into the lower 80s across the Portland metro area. My vacation went well; my family and I spent 6 days camping in Maupin, Thompson Reservoir (near Silver Lake), Eagle Lake (CA), Mt. Lassen (CA), and Lake Almanor (CA). Spent 6 hours in Quincy, California waiting for a front end alignment and new tires, that was in interesting little town. The next 4 days were spent at Squaw Valley, California at the 42nd AMS Broadcasters Conference. I noticed two themes during our travel. First, if you don’t have a real warm ridge overhead in June, temperatures up around 4,000-7,000′ elevations are going to be chilly! We woke up to frost at Thompson Reservoir and again the first night at Squaw Valley, although in that location it was viewed from a hotel room so quite a bit more tolerable! If you’re headed to the higher elevations (most of northern California and southern Oregon east of the Cascades/Sierra), you want a hot ridge overhead. The other thing I noticed everywhere was the drought. All reservoirs and lakes are low. At Eagle Lake the marina was totally dry with docks sitting on dry land. Goose Lake between Lakeview and Alturas appears to be totally dry. That does happen every few years, but it seems early in the season for that. Lake Tahoe was a bit low too. Okay, one more thing…there is nothing of any interest on US 395 between Alturas and Susanville. That was the deadest 70 miles I’ve seen since a trip across Nevada a few years ago! Moving on to weather…I missed a thunderstorm day a week ago, but maybe we can get some action in here either Wednesday or Friday as a cool upper-level trough and westerly flow moves overhead the 2nd half of the week. It also appears we’ll get a good soaking one or both of those days. Models show the wet westerly flow amplifying a bit the first half of next week for warmer temps, like what we just saw the past two days. 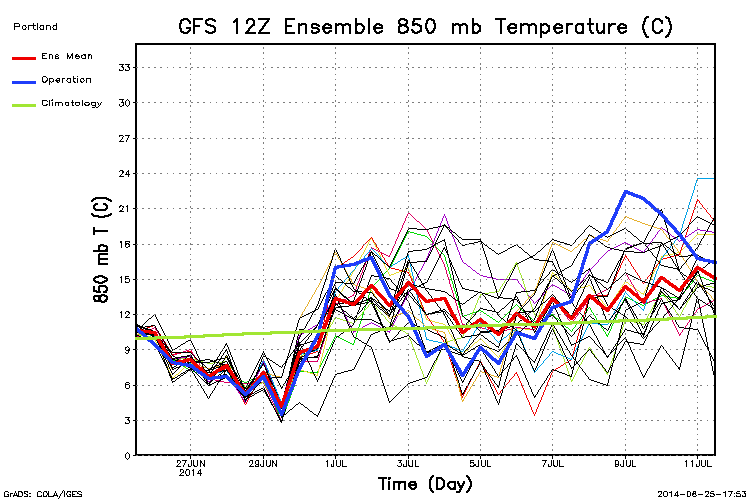 Notice the ECMWF meteogram is quite warm along with the GFS ensemble chart too next Monday-Wednesday. I’ll be on vacation tomorrow through next Monday, then at a weather conference near Reno the rest of next week. So no new posts for a week. Maybe there will be some interesting weather news at the conference; if so I’ll share the info here. Otherwise enjoy the cool and showery weather because it appears we may have warmer weather next week. I’m headed for Eastern Oregon and then Northern California for camping…looks like some chilly nights in the high desert later this weekend and over the weekend. Hmmm, maybe I should head for lower elevation spots? 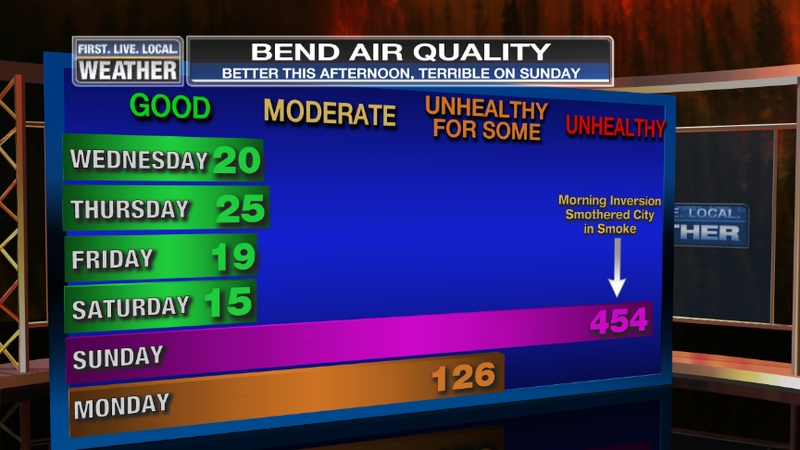 Central Oregon is generally known for clear skies and good air quality, but not on Sunday! Take a look at the Bend DEQ station’s air quality for the past 6 days. Looked great until Saturday night; that’s when the wind died down and the smoke settled down into the lower areas. Those numbers are the peak for each day, and for both Sunday and today the peak was in the late night and early morning hours. Good news short-term in the fire weather forecast is that we don’t expect hot weather, lightning, or real high winds. In fact it’ll be quite cool in that area west of Bend Thursday and Friday; high temps only in the 60s. The bad news long-term is that the southern half of the state is extremely dry and well ahead of “fire season schedule”. I think it’s going to be a long summer for firefighters in the Pacific Northwest. Everything seems to be pointing to at least average temperatures for the summer and many indications are for warmer than average as I mentioned in an earlier posting a couple weeks ago. 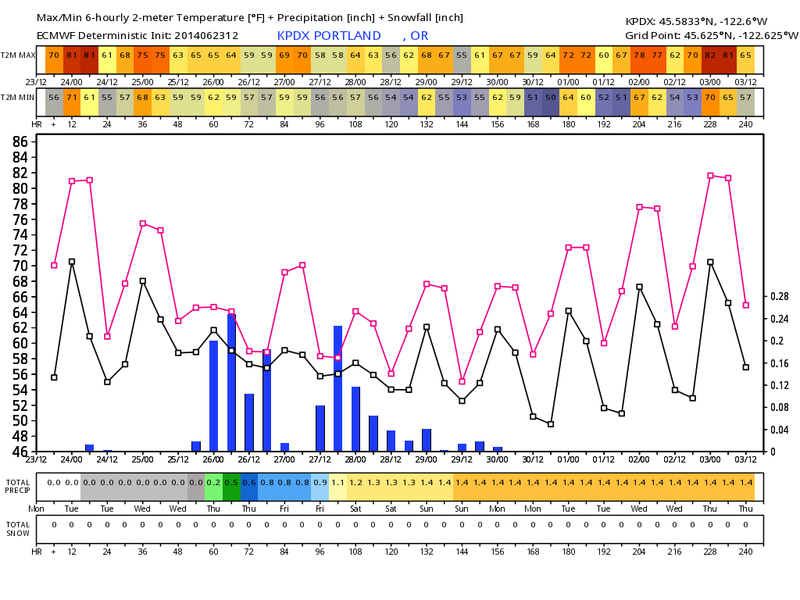 In the short-term, models are giving us an upper level trough on Thursday/Friday and possibly another Sunday. Neither appears to be a significant rain producer, even here in Northwest Oregon. 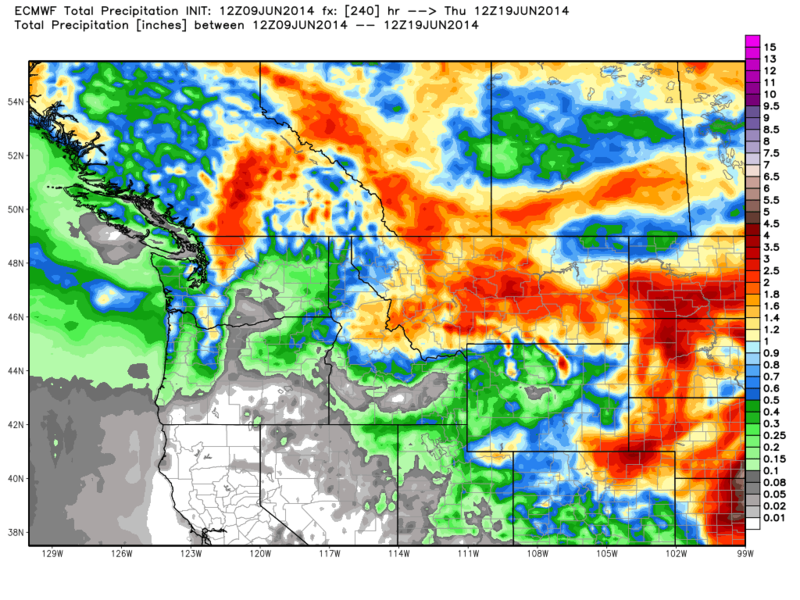 Here’s the 10 day ECMWF rain forecast showing less than 1/2″ rain in the lower elevations of Western Oregon. The 16 day 12z GFS model showed less than 1″ as well, more like 1/2″ to 3/4″ for most of us. 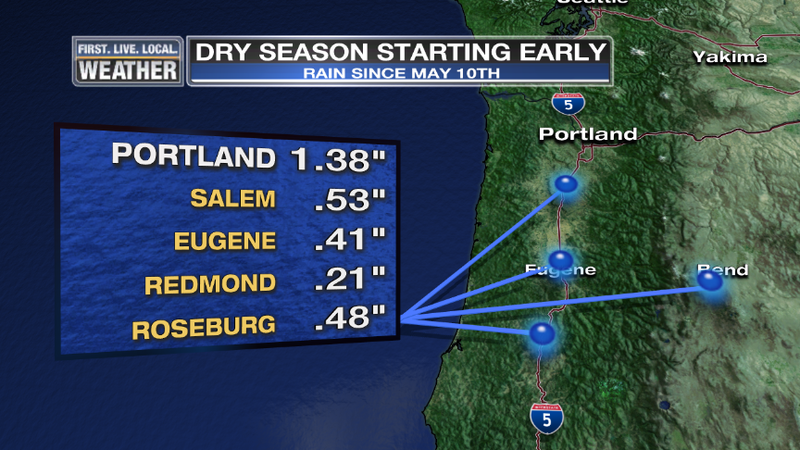 You are currently browsing the FOX 12 Weather Blog blog archives for June, 2014.